I’m afraid I didn’t have any moment of heightened awareness on the solstice, but it wasn’t for lack of being alert. For a little while, a crow gave me hope. 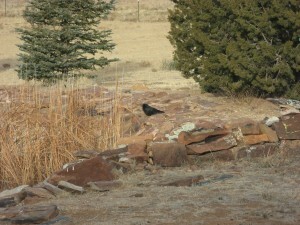 I spent most of that weighty time out at sister Kate’s country place, and the crow came to visit her icy pond. Actually many crows visit because she has a bird feeder on the north side of a big juniper. As the flock came and went, however, this crow sat alone by the pond, just looking toward the south. It was all fluffed up against the cold, its solitary, unmoving station on the ground unusual. He goes on to say that wherever crows are, magic is also. They appear to remind us, he says, that there are opportunities to create all around us every day. All of the symbolism seemed to reinforce the solstice idea that a new and better world is in the making and that each of us can play an important role in imagining what that would look like. I took a photograph of the bird and continued to observe it as we went about the business of baking. I thought there was a possibility that it had come to the pond to die, which would become a memorable solstice story. After a brief intermission, however, I glanced back and the crow was gone. Nuts. I have to admit that I like date-driven drama, and of course that gets into the field of prophecy. In about 1995, I was introduced to the idea of “earth changes” as prophesied by a gentleman named Gordon Michael Scallion. I acquired a now-tattered map of what the United States was supposed to look like after the earth tipped on its axis–supposedly sometime before the year 2012. New Mexico would have become somewhat tropical, and the Pacific Ocean would have been lapping a beach just north of Durango, Colorado. Guess that’s not going to happen, but it did lay the groundwork for climate change. Then in 1999, I stocked up on food and water in preparation for Y2K. I’m sure everyone remembers that we were anticipating worldwide computer disaster on January 1, 2000. Memory space was limited at the time and expensive, and so programmers had used two digits for the year instead of four. This was predicted to cause a worldwide meltdown during which there would be no electricity, heat, or running water. The day passed and all was fine, and actually the alarm generated well over about $300 billion in revenue for computer experts. So now I guess the collective conscious is getting a bit jaded. If somebody brings up a new date, the response will be, “Yeah, right.” That three thing, you know. Three strikes and you’re out. Nevertheless, big things are looming—the fiscal cliff, the gun control battle, further global warming disasters, and potential earthquakes. The prophets of the moment are politicians and scientists; and although the dates are fluid, urgency is still afoot among those open to the concept of catastrophe. There are things we could be doing to mitigate the damage on every front. And we have a full moon tomorrow, its overbearing light reminding us yet again what an important role it has played in the development of the human capacity for abstract thought. Its phases imbued us with the concepts of time and cycles, of opportunity waxing and waning. And as the year wanes along with this moon, most of us begin to address the New Year’s resolutions that will shape not only our lives but also the world.